If you are on Keto or any low-carb diet this is the perfect treat for you (these are also vegan), each one containing only 3.8 grams of carbs. 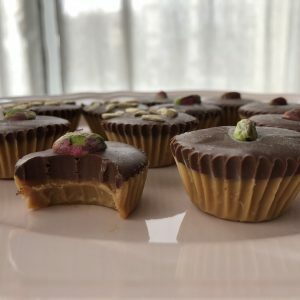 The peanut butter layer is made with coconut oil and the chocolate layer is made with coconut milk, these are added to make them super soft and creamy in the end. I used an 85% dark chocolate but if that is too bitter you can use anything above 74% and you should be ok with the carbs. Line your mini cupcake tray with paper liners, we will fill all 24 cavities. Add peanut butter and coconut oil to a small saucepan, melt over medium heat until it melts down completely mix until both ingredients are completely combined then remove from the heat. Add your vanilla, stir. Divide your mixture in between the paper liners, the usually end up being filled 2/3 of the way. Freeze for 1 hour before proceeding to chocolate layer. Break up chocolate into small pieces and add it to a heat-safe medium bowl, add in the coconut oil and salt. Set aside. In a small saucepan heat up your coconut milk until it just comes to a simmer, then immediately pour over the chocolate, allow this to sit for 30-40 to allow the chocolate to melt. Then gently stir with a silicon spatula until smooth. Divide this mixture over your frozen peanut butter layer. Decorate the top with nuts if you like, then freeze for an additional 1 1/2 hours (this way the paper will peel off cleanly). You can store these in an airtight container in the freezer for up to 1 month or in the fridge for up to 10 days. I like to keep them in the freezer and whenever I want one I just remove a piece and let it thaw at room temperature for 5-10 minutes, it depends on how soft or hard you like them.